The Red Cross has announced it will begin impartially distributing humanitarian aid in crisis-torn Venezuela in two weeks, saying it will not allow any political "interference" in the operation. "We estimate that in a period of approximately 15 days we will be ready to offer help," said Francesco Rocca, head of the International Federation of the Red Cross and Red Crescent. Mr Rocca told reporters in Caracas the organisation would begin distributing aid that President Nicolas Maduro has to date refused to allow into the country - leaving it stockpiled since mid-February on the borders with Colombia and Brazil. The Red Cross would act according to its principles of "impartiality, neutrality and independence," he said, "without accepting interference from anyone." "We hope to help 650,000 people at first," Mr Rocca said at a news conference in the Venezuelan capital. Nicolas Maduro ordered the border closed to keep out the aid, thwarting a high-profile operation by US-backed opposition leader Juan Guaido to bring badly needed food and medicine into the country. At least seven people were killed and dozens injured in subsequent rioting at the border. The socialist leader said aid would be a precursor to a US military incursion. "That was an issue that was very politicised," said Mr Rocca. "If that help complies with our rules and our protocols, of course we are willing to distribute it." About 24% of Venezuelans - seven million people - are in dire need of humanitarian aid, according to an internal UN report that showed malnutrition and disease were on the rise as living conditions plummet. Nicolas Maduro’s government, which saw the report this week, insists that US sanctions, as well as actions by his rival Juan Guaido, are to be blamed Venezuela's economic crisis. 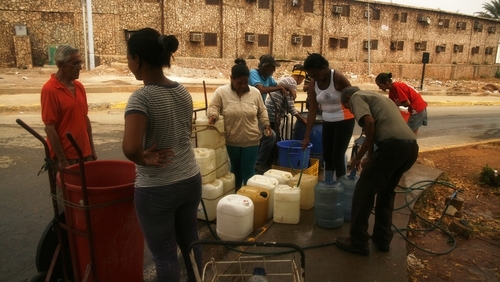 According to the 45-page report released by the UN, 24% of the Venezuelan population currently living in the country are estimated to have urgent priority needs for assistance and protection. More than 94% of the population lived in poverty in 2018, including 60% who lived in extreme poverty, according to a survey by three universities in Caracas quoted in the report.